How to customize the landing page of your business website? Find Static FBML App: – The very first thing that you need to customize your Fan Page is called “Static FBML”. You can make a Facebook search or you can find it over here: facebook.com/apps/application.php?id=4949752878 . Just add this fabulous app to your page. Static FBML is basically a very simple yet highly effective facebook apps. It acts like a blank canvas and lets its users put anything there. You can put anything in it that you want to display. You can put graphics, HTML, links etc. Setting UP Tab: – So, you have successfully added the Static FBML app. Now, click on the text “Edit Page”, which is located just beneath of your company’s profile image. It will open up your settings and apps, now look for the FBML app, and click on to the “Application Settings” link. The app can be utilized in two ways: you can either use it as one dedicated profile tab or as a set of boxes. Tab option may come in handy when you are at a splash page however; you need to make sure that “Box” setting is removed and the tab setting is added. Add Content: – Once it is done, you need to go back to your setting and click on the “Edit” link under the Static FBML app. It will give you a standard text area where you can put everything that you want to feature in your Facbook Fan Page. 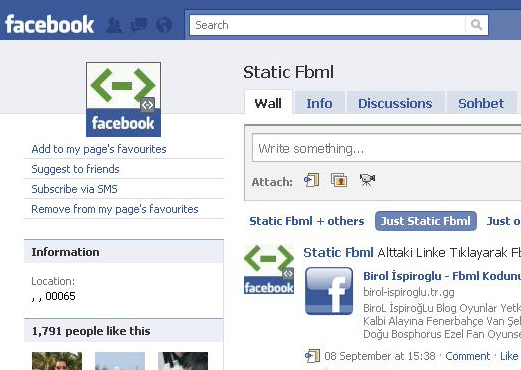 Give a name to your fan page in the “Box Title” and add standard HTML in the FBML section. There is no need to use HEAD, BODY or HTML tags here in this section. Make It Your Default Land Page: – Now, it looks good and perfect and you want to make it the face of your “Facebook Fan Page”. SO, time to go back to your “Wall Settings” and find the option “Default Landing Tab for Everyone Else” and select it and you are done. From now on the first thing your visitors will see is your customized fan page. We hope that you will be able to do something different with Facebook Fan Page. Terrific Post! I am really into social media right now (like everyone else out there! ), especially Facebook Marketing and FBML. It can be hard to keep up to date with such a fast changing innovative topic but I manage to do it through the fan page factory and blog posts exactly like yours. Tips and tricks rock. I am trying to learn as much as possible to put myself ahead of the curve. So thank you again! very nice post.thanks a lot. it is very useful for facebook users. I love reading through and I think this website got some truly useful stuff on it! Well thought out article, sir! Thankyou! Simply wanna remark that you have a very nice site, I enjoy the style and design it actually stands out.